Recently my husband and I went to my 50th high school class reunion. Although I graduated from a California school, the reunion was held in Las Vegas Nevada. At first, I wasn’t sure I wanted to go. I hadn’t kept up with any of my classmates except for Margaret, who wasn’t able to attend. The only reunions I’d attended over the years were my 10th and 20th. It seemed that with both of those the only things anyone wanted to know about were things about profession, success and family size. Not that I had any objections to those things, but I wondered how much any of them truly mattered in God’s grand scheme. However, as I considered this big one, it seemed prudent that I attend. After all, it was likely there wouldn’t be another reunion after this. Surely it would be good to see if the professing Christians at the last reunion were still walking in faith and I wondered if any others had also come to salvation. And, Okay I’ll confess there was one more reason I decided to go. Admittedly, my own vanity raised its ugly head, as I considered this event. I felt a lot better about myself and my appearance, than I did in high school. Back then I was a very skinny freckle-faced kid with hard to manage natural curly hair. Teens can be cruel at times and some deep pain still lingered from those days. Now years later, my figure had filled-out fairly well, and my hair was a pretty blond coifed style. Plus, people say I look younger than most our age. I was curious to see if anyone would realize how much of an improvement there was since those gangly, awkward and difficult teenage years. Would my improved look make a difference? “Vanity of vanities…all is vanity” says the good “preacher” Solomon. But, maybe some of the hurts and wounds inflicted back then, could find restoration and reconciliation now. Besides, I reasoned, I’d found just the right dress – not too dressy, comfortable, and very cute. The evening of the big event came. We entered the banquet hall and I scanned the room to see if anyone I remembered was there. Who are all those old people? I nearly blurted out loud. It quickly became clear that it wasn’t going to be easy to recognize old acquaintances either. After wandering around the room trying to spot familiar faces to sit with, we gave up our futile efforts and simply chose a table that had spaces left. A few minutes after sitting, the gentleman to my right asked who I was. When I told him my name, a light of recognition struck his face; he stuck out his hand in greeting and with a big smile said his name – David. Suddenly, something in his bright eyes and sparkling expression broke through with great familiarity and recognition. It wasn’t long before we also discovered that both he and his wife were strong believers. Ironically, the other couple sitting at our table seemed familiar too, but it wasn’t until we started talking, and personalities came out, that we both recognized each other. Happily I learned they were also believers. He had come into faith several years after graduation. Throughout the evening, it seemed that recognition mostly happened through expressions, personalities, and character. By the end of the event, I was able to connect with several friends and familiar classmates. 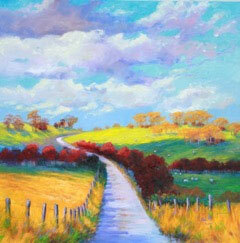 Joyce, was a gal who had been in several of my art classes and she too had become a believer. She lived in a nearby town and we talked about getting together after the reunion. Another gal had struck me as familiar, but after introductions neither of us could remember knowing each other in school. It wasn’t until after the event that it we realized we had an even greater connection than school – the connection of Christ. Her name was Susie and she had since become a believer several years after graduation as well. No wonder her face shined with a certain joyous glow. One week after my reunion, I received an email from Susie. She had noticed on the directory that I lived in her area and something I’d said made her wonder if we shared a common faith. We were able to get together for lunch a couple of weeks after the event. It was great to have this new Christian connection and share in spiritual matters of significance. As we sat having lunch, Susie shared that she had recently experienced an interesting church service. The pastor had asked the congregation to text him questions they had about heaven and eternal life. One of the questions regarded whether or not we would recognize friends and family when we get “up there.” I asked what he said and it was very much in line with what I believed according to scripture. Because we’ll have new bodies- “glorified bodies, ”when we get to heaven, I believe that it might take some time before we recognize each other when we. It would be somewhat similar to how it was after Jesus was resurrected from the grave and had his new body. People didn’t recognize him at first. Ephesians 5:27 says: the church will be presented to Christ at His second coming “without spot or wrinkle.” And, much like our experience at the school reunion, it will take a while before we recognize each other in heaven. At the reunion, most of the time, the spark of recognition came as the individual’s personality and character showed through their eyes and expressions. That will also likely be the key to identification,—not our appearance. Days after the reunion, I reflected further on what I’d observed. This time many were now interested in the things of the Lord instead of the things of this world. Of course there were exceptions, but at this reunion, thankfully, many had come to the realization that there was something and someone much more important in life than career, success and even family. And, in case you want to know, my own vain reasons for attending melted away too. God’s word makes it very clear that we won’t bring any of those kinds of accomplishment with us into eternity. We won’t need to worry about impressing others in heaven with our clothes or figures. Nothing of material success, accomplishments, or even number of kids and grandkids will matter in eternity. The only things we’ll bring with us into heaven will be the attributes that God’s Holy Spirit have placed in our souls. And the only treasures we can attain there will be the spiritual treasures that we’ve built into eternity. 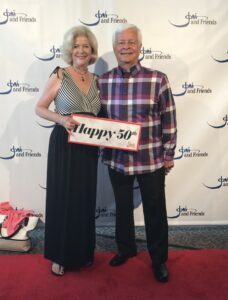 Not long after this event, my husband and I attended a 50th anniversary for Joni and Friends to honor our friend Joni Eareckson Tada. In many ways this was like a reunion for her as she reconnected with old friends and supporters. At the event I picked up one of her books, that I hadn’t yet read. It was Joni’s first book, “Joni, an Unforgettable Story”, and in it she talks about the kinds of things we’ll bring with us to heaven. “The only thing we can take with us to heaven,” she says, “is our character. Our character is all we have to determine what kind of a being we will be for all eternity. It’s what we are that will be tested by fire. Only the qualities of Christ in our character will remain.” (Chapter 15, page 174). Wow! What a grand and hopeful word He has given us regarding our aging bodies. One day, we will have perfect, “heavenly clothes” to wear for eternity. Talk about the perfect dress! Out of our large class of over 900, sadly about 143 were already deceased. Around 250 attended that night. I’m pretty sure that many of those who had passed away, never received the promised seal of salvation and a guarantee of a new and glorious body for all eternity. And so, much like my 50th, many of them won’t be attending that reunion either. I pray that many will be there and we can reconnect then. And, as Joni said, it will be the qualities and spirit of Christ in us that will shine through. It will be the good qualities of our personalities that were perfected by the Holy Spirit that will spark recognition when we get to that great eternal reunion. So, it may take awhile before we recognize each other in that great and classiest reunion of all, but we’ll have all of eternity to figure it out. And what a celebration that will be. with friends and is a blessing indeed. with helps and good deeds. reaching from here to there.